5 | 322 students enrolled. NISM has launched the NISM-Series-XIII: Common Derivatives Certification Examination as an "additional choice" which the candidates may choose to take instead of appearing for the Currency Derivatives (Series-I), Interest Rate Derivatives (Series-IV) and NISM’s Equity Derivatives (Series-VIII) examinations individually. The preparatory course aims to enable a better understanding of various derivatives products available in the three derivatives segments (i.e., Equity Derivatives, Currency Derivatives and Interest Rate Derivatives) and understand the various trading and hedging strategies that can be built using futures and options, regulations and risks associated with these products and the exchange mechanisms of clearing and settlement. During this programme the students will be able to understand the financial structure in India and the importance of the different rules and regulations governing the Indian securities market, especially those related to the exchange traded derivatives.We provide all kind of support to the participants to ensure that they clear the examination with flying colors. This programme will enable the students to prepare exhaustively for the NISM Series XIII Certification Examination.The participants of this course will be provided with a series of preparatory videos,free email query,online student's community support where they can post their queries and study materials.There are mock tests designed after each session to check and ensure the level of understanding of the students.All the knowledge content is provided by Kredent Academy. NISM-Series-XIII: Common Derivatives Certification Examination is useful for fresher’s who are new to the market and would like to get introduced to the basic knowledge of Derivative markets in all segments (i.e., Equity Derivatives, Currency Derivatives and Interest Rate Derivatives). For the approved users and sales personnel of the trading members of the Currency Derivatives Segment of a recognised stock exchange and trading in Currency Derivatives , Interest Rate Derivatives or equity derivatives, this course is a perfect choice! 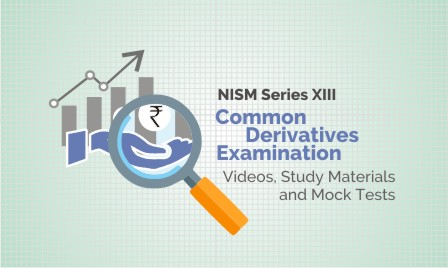 NISM Series XIII - Common Derivatives Examination is a preparatory course designed to aid you in your preparation for the final NISM Series XIII - Common Derivatives Certification Examination. There are mock tests designed after every section of the course to test the understanding of the students. These mock tests have been designed in a similar pattern as it will be in the NISM final examination to help the learners in preparing for the final examination.